Reminds me of when news magazine covers sold plenty of extra copies in Australia. It is a Wow moment as in Wow even Time magazine has sunk to the level of manipulative fake news. The mother payed $6000 to be smuggled across the border for a better life in the USA, she wasn’t fleeing persecution. The child was taken without the fathers permission and the child hasn’t been separated but is being housed in family accommodation with the mother. It’s getting really hard to sort the crap from the clay isn’t it. Conflicting media stories are ‘the norm’ now and no one seems to care. The more sensationism and drama the better. If they happen to include some ‘facts’ it’s a bonus. Wow. Ill probably return 1 of 2 copies. Australia’s immigration policy is tougher and has less compassion than the USA has. Trump has done a great job as President. Our treatment of people seeking asylum is appalling. Trump’s behaviour as president is appalling. 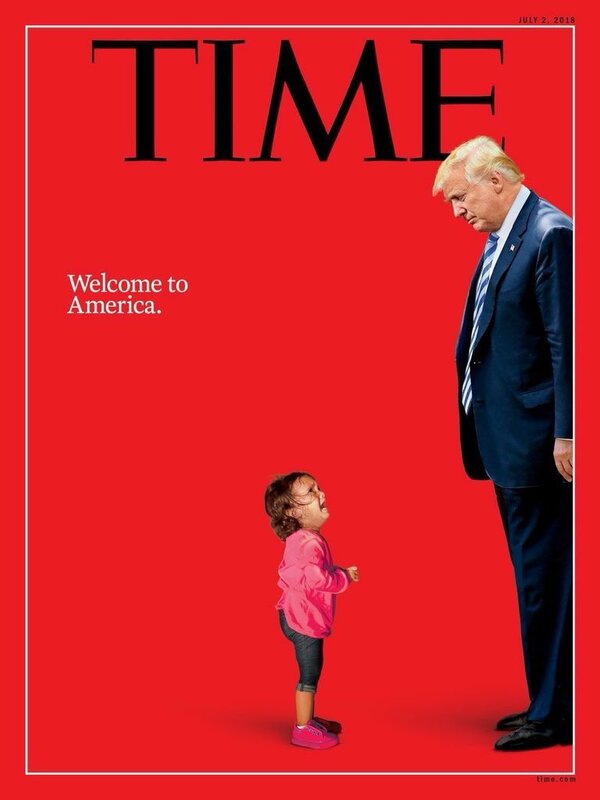 The Time created cover illustration is a powerful image. It reflects the facts of the decision of Trump for zero tolerance. What immigration policies would you put in place of the current ones? Illegal immigration is an increasing problem over the entire developed world and different countries are tackling it in different ways. The EU after trying the come one come all approach is changing tack as the wave of immigrants swells and are turning away boat’s that 2years ago would have been accepted. In Australia the wave of immigrant coming from Indonesia, Sri Lanka and else ware by boat swelled under the policies we had at the time and unpalatable measures were put in place to contain it. No one likes what is happening but unless you put up alternatives and are prepared to defend them intellectually you add nothing to the debate. It feels nice to be all woke and parade you moral superiority but if you can’t put up a viable alternative it’s just vacuous virtue signalling. The treatment of problem is always the cause of that probem. we have peole intellectually wanking with soft ebautifual words “bandaiding” this problem which is now a major issue. Someties we have to be “cruel” to be kind. Who is the you you point your finger at Steve? If the you is me, I’m not about to debate immigration policy with you here as this is not the place. This post is about a magazine cover that reminds me of when news magazine covers sold plenty of extra copies in Australia. I don’t want or expect a debate here. I’m just pointing out if people don’t like whats going on now they need to have a viable alternative. Otherwise your no better than Pauline “I just don’t like it” Hanson. Correction: Otherwise they’re no better than Pauline “I just don’t like it” Hanson. Apologies Mark I wasn’t intending to make it personal, and apologies for using the wrong spelling as well. It’s the end of a long week.